Reprint. Originally published: Basingstoke: Palgrave Macmillan, 2013. 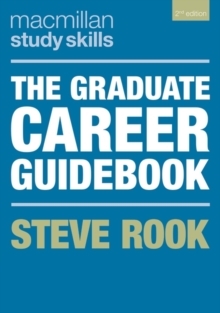 Written by experienced careers advisor Steve Rook, the new edition of this indispensable guide will help readers to develop the skills they need to land their dream job. It breaks the career planning process down into manageable steps, from researching roles and gaining work experience to crafting a stand-out CV and impressing at interview. It also includes practical guidance on networking, entrepreneurship and responding to job offers. Packed with reflective activities, top tips for successful applications and real life case studies, it contains everything students need to develop their skills, get their foot in the door and set themselves up for a fulfilling future. This text will be core reading for students on a wide range of career-related and employability modules. It will also be an invaluable resource for students researching their career options independently.